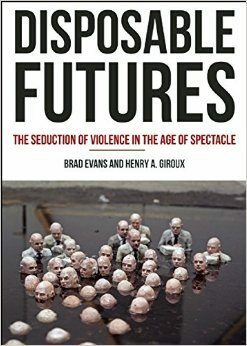 Disposable Futures is a political and philosophical manifesto of sorts, but it is not always easy to follow. This is mainly because it is primarily constructed as an academic work, with roots in French critical theory (particularly Guy Debord’s book Society of the Spectacle). Authors Brad Evans and Henry A. Giroux, who holds the Global TV Network Chair Professorship at McMaster University in Hamilton, Ontario, clearly want to reach a broad audience – they respond directly to popular culture and often write in an impassioned, rhetorical voice. But the general reader will find their analysis a tough slog. By “spectacle,” the authors mean the products of mainstream media. All of this content – from news programs to reality TV to zombie films – has a political role. That role, the authors argue, is to propagandize for neo-liberal ideology (“neo-liberal” being an overused word here, standing for the most brutal and exploitative aspects of free-market capitalism). There are, Evans and Giroux contend, three essential aspects to the neo-liberal message. In the first place, a certain segment (perhaps even a large proportion) of the population is now considered disposable: excess lives of no value except as fodder for violent entertainment. Second, the neo-liberal triumph marks the inevitable end of history. Finally, and a bit surprisingly, this inevitable end represents not Utopia but catastrophe. Neo-liberal ideology has appropriated disaster and made the logic of capitalism not progress, but regression to a savage state of nature. Optimism, in this conception, is an Orwellian thought crime. The future has also been made disposable. These points are all well worth considering, and are helpfully related to various trends in pop culture centered on the normalization of violence. The connection between disposable people and zombies is especially apt, while the chapter on internet surveillance is the only part of the book where the authors seem to go wandering. What’s unfortunate is that these ideas are not presented in a more accessible voice. If you’re not accustomed to the use of “imaginary” as a noun, you’re not going to be up to speed, and the mostly unnecessary borrowings from other theorists and academics will likely lead only to confusion. Such specialized language is unsuited for a book of this sort, which has something important to say to all of us.